Today We Are Going 2 Learn How 2 Make Windows 7 Bootable USB (PD) Without Using Any Tool or Software ..
First Open CMD Promt With Administrator Rights !! Then Fire Following CMD !! 1 : DISKPART // Here U Get Started Diskpart ! 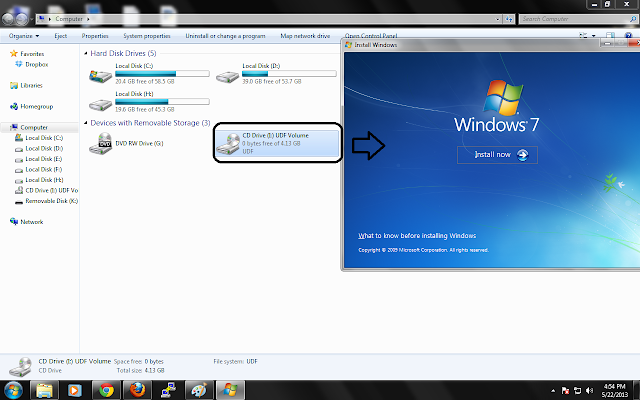 2 : LIST DISK // Here U will see All Memory Device's Like Your HD or PD ! 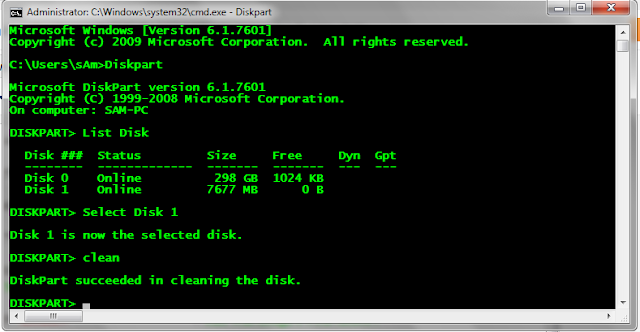 3 : SELECT DISK 1 // Then Select Your PD , In Which U want 2 Intall WIN 7 ! 4 : CLEAN // This Will Clean U r PD ! 5 : CREATE PARTITION PRIMARY // This Will Cr8 a Primary Partition in U r PD ! 6 : SELECT PARTITION 1 // The Partiton Which U Cr8ed Before ! 7 : ACTIVE // This Will Make it Active ! 8 : FORMAT FS=NTFS QUICK // This Will Format U r PD With NTFS File System In Quick Mode ! 9 : ASSIGN // This Will Assign U r PD Active ! Here I Mounted Windows 7 In My "I:" Drive Uisng Power ISO ! Note :: Dont Copy the ISO Image File in the PD !! --> Copy the Content of That ISO file in Your PD ! !